Total overall height of the Trakkaway Aero4 motorhome sits at 3.04 metres, adding only 0.14 metres to the height of our Aero2 layout. The Luton over the front cab seats features 2 opening windows with blind/screen system and LED reading lights. Bed length is over 2 metres long. A ladder is set up for access in and out of the bed/storage area. 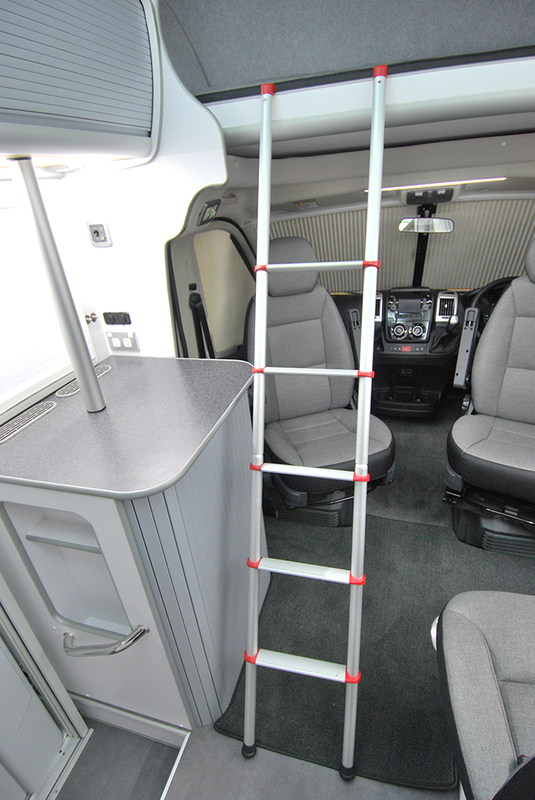 Ladder doubles as a partition to secure smaller children when sleeping or to secure stored items when travelling. Passengers in front swivel seats enjoy plenty of head room when seated. If the luton bed/storage area is not in use, it is simply pushed upwards out of the way. Little effort is involved thanks to gas strut assisted lift. When the bed is lifted out of the way, passengers have easy access into the area with plenty of standing height.